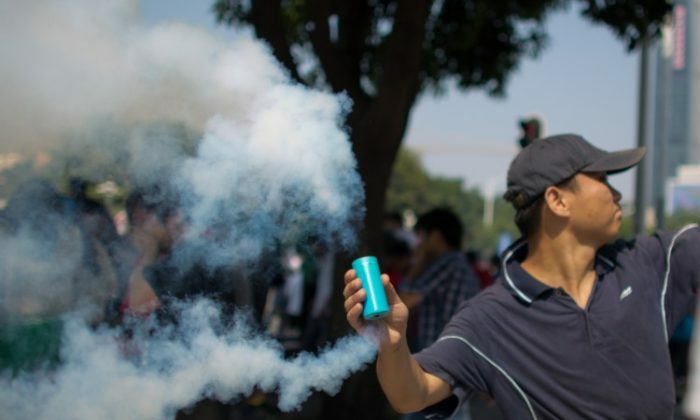 Chinese netizens are very interested in who is behind this, as information has emerged online over the last few days revealing that at least some of the anti-Japan protests that have rocked China over the last week may have been deliberately organized. 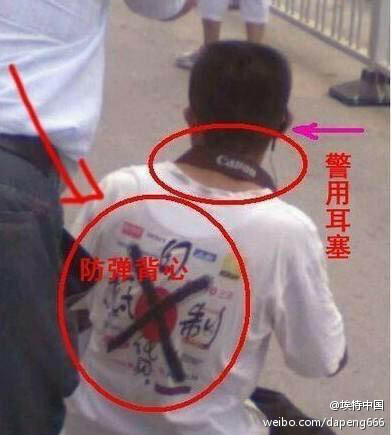 Since last week, and especially over the weekend, protests against the Japanese in China have been escalating. The proximate trigger of the outburst was the announcement by Japan that it would nationalize the Senkaku Islands, an uninhabited, rocky set of isles in the East China Sea whose ownership China disputes. Despite many Chinese disagreeing with the Japanese government’s territorial claims to the Senkaku Islands, and especially with its bold move to formally acquire them, many online have expressed dismay at the violent response by the Chinese. Japanese cars have been sabotaged, smashed, set aflame, and overturned; Japanese restaurants have been looted; Japanese supermarkets have been ransacked; in one instance, a Japanese man had a bowl of hot noodles thrown in his face; and recently, mass protests have filled the streets. But Internet sleuths are raising questions. Internet sleuths say that a plot may be afoot, pointing to men who appear to be police and CCP officials leading the protests. Netizens have focused on an instance of a man wearing what they suspect to be a bulletproof vest and what they say is a police earpiece, but aside from this, there are other instances of what netizens say is suspicious government involvement. One protest leader was identified as Zhu Gu, a CCP member and the director of a police station in Xi’an. When a composite image of the man at the protest and an image of the official that closely resembled him were posted on Sina Weibo, a popular microblog service in China, they were swiftly purged by Internet censors. A Weibo user who wrote, “Pay attention to this man. 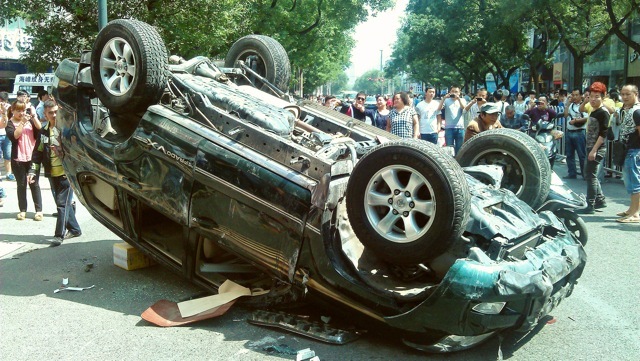 He’s the main ringleader that overturned three cars on Huancheng South Road,” pointing out the picture, later had the account blocked. There were protests in over 57 cities in China, according to World Journal, a Chinese newspaper published outside of China. A number of other Weibo users noted that many of the protesters were not local, did not have rail passes, and did not speak the local language. One Guangzhou resident suspected that they were sent from out of town to make trouble. 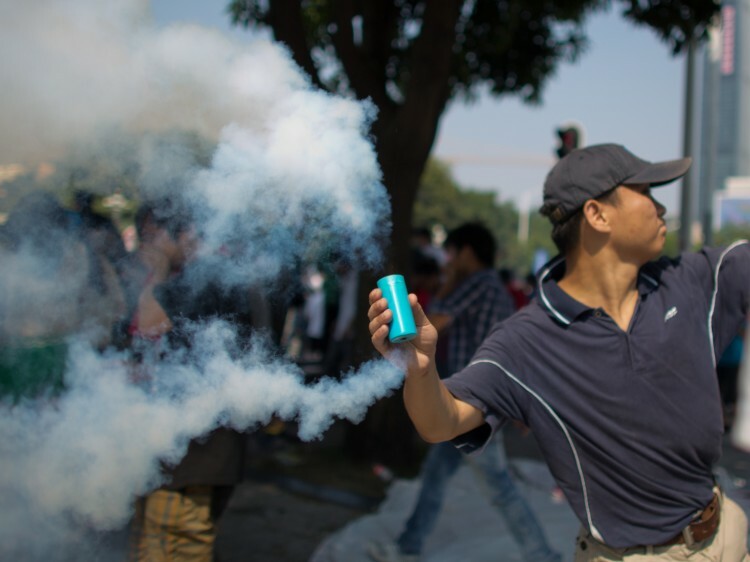 In many cities, police in uniform or other security forces kept the protesters in some semblance of order—in contrast to the usual role played by Chinese authorities, who crush any protest perceived as antigovernment. And in contrast to the helpful treatment extended to anti-Japan protesters, protests organized by democratic groups were dismissed. Zou Wei, a member of a democratic party in Guangzhou, was put under house arrest after he submitted an application to hold an anti-Japan demonstration. Communist Party officials walk a fine line with the protests, attempting to ensure they are not co-opted by groups who have a message that is at odds with the regime’s, according to Huang Qi, director of the Chinese human rights website 64tianwang.com. 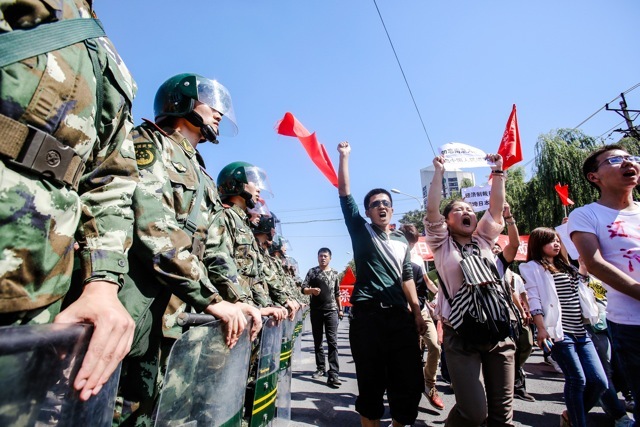 “They are worried that the focus of the protest may shift if dissidents are present, and the protest might even target authorities’ corruption,” Huang told Sound of Hope Radio. The most prominent theory of who the “someone” is, is hard-liners in the security and propaganda apparatus who are aligned with former regime leader Jiang Zemin; many owe their political legacy to the implementation of Jiang’s persecution of the Falun Gong spiritual practice. Though some analysts and insiders indicated that arrangements for the upcoming leadership changeover this fall were settled, the recent absence of Xi Jinping, the presumptive next leader of the regime, and the dispute with Japan may have given this group an opening to exploit and push for greater power, according to analysts. An article published in Boxun, a Chinese-language dissident website outside China, said that security officials and supporters of ousted official Bo Xilai have been supporting the protests in an effort to postpone the 18th Party Congress and give hard-liners more time in personnel negotiations.